Although it’s not his given name, Giant is a fair description of this gorgeous Balinese man with hands the size of plates. You can find him at Amo Spa in Canggu. He takes bookings for all sorts of massage, but we recommend the relaxing full body treatment which is designed by an orthopedic surgeon and then delivered with the power of a gentle giant. Try the 90-minute rejuvenation massage which is pressure point focused and has the added benefit of hot stones. You’ll walk away with all of those aches and pains released. We recommend you indulge in some foot reflexology while you’re there and choose one of Amo’s natural oils. They’re made organically by the chemists on site. You can select an uplifting blend like minty Jojo or something more relaxing like vanilla love. Further to this, if you are really sore from working out, or you have chronic pain problems try the combination sauna, spa and salt plunge pool. The temperature changes as you toggle back and forwards between the pools restores blood flow to your vital organs, increases circulation and helps to eliminate toxins. Cokorda Rai is a medicine man (Balian) based in Ubud. He’s well known and uses a combination of Reiki, pressure points and empathic healing methods to assess your body. He’ll start by asking you a few questions and then explain the deeper meaning behind your physical or emotional pain. You’ll come away with some advice on what to eat and possibly some recommendations for vitamins to take. He may also use small sticks to prod pressure points in your feet to move the energy around. You’ll need to cover your shoulders, wear a sarong and bring an offering with a small amount of money in return for the treatment. Ask your villa manager to organise transport to take you there but be prepared to wait awhile for your treatment as people come from all over the world to visit this man. Address: Jl. Raya Singapadu, Singapadu Tengah, Sukawati, Gianyar, Bali 80582, Indonesia. Amanda Jane is a long time resident of Bali and runs a range of fitness and wellbeing retreats here. You can visit one of her specialised fitness retreats, but it’s also worth the time to connect with her for an individual life coaching or healing session. She works with a variety of healing modalities including NLP, yoga, Qi ging, mindset awareness, nutrition, Reiki, hypnosis and theta healing. Amanda is very intuitive and can personalise a treatment session to suit you. Her speciality is helping you to move through old traumas and let go of bad habits to connect you with your most divine purpose. 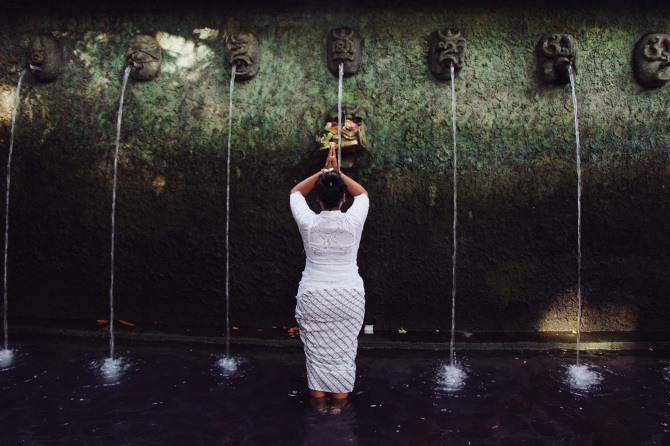 Ibu Jero is a fifth generation Balinese high priestess who is gifted at helping clients let go of old fears and beliefs that may be holding them back. A visit to this healer requires an open mind and a change of clothes as she uses water as part of the healing ceremony. You can visit her by yourself or as part of the group. Awkward alert: She uses Reiki to extract blocks from your body and then burps them out during your session so try not to giggle as she releases that negative energy through her mouth. The lovely thing about Ibu Jero is that she’s happy to answer your questions after the healing, so if you’re confused about anything, don’t hesitate to ask for clarification Your visit may include a trip to a cave or waterfall if you’re in a group so don’t hesitate to bring a photographer. You’ll leave feeling lighter and more positive about the world, even if you’re unsure about what just happened. On this list, you’ll find someone for everyone so try opening your mind to something new to take advantage of one these exceptional healers next time you’re in Bali. Some of them will come to your villa, others may welcome you for a visit to their studio or retreat centre on the island. Bali is the best place to fill up your energy tank, start a new self-care regime, heal from a sports injury, recover from a broken heart or just take some action to make life a little easier to deal with… We look forward to meeting you and don’t hesitate to get in touch if you’re keen on some amazing accommodation while you’re here.